The basic plotline: boy meets girl, they used to be high school classmates and they reconnect through a mutual love for the Beach Boys. The girl's mysterious past is the real driving force behind the story. The first part of the film is quite likeable. The male lead Kosuke is played by Arashi's Jun Matsumoto (whom Australian audiences are likely to know from the idol group's game show VS Arashi). While the female lead Mao is played by Juri Ueno, a versatile actress known for playing diverse Japanese drama characters, such as a naive musical protege in Nodame Cantibile and a pre-op transman in Last Friends. Kosuke is an unlucky in love likable underdog, convincing as the character is not too vastly different from the roles Matsumoto usually plays in Japanese dramas. While Mao is a manic pixie dream girl (read really eccentric dream girl) played superbly by Ueno; who an give New Girl's Zooey Deschanel a run for her money. You will buy into their love story, which is not too out of place in a Japanese drama. However the sickly happiness must come to an end as Mao starts experiencing health problems related to her.....dun dun dun mysterious past! Mao doesn't have a single memory from her first 13 years of life. I walked into the cinema expecting to cry to my heart's content, hoping for the chance to shout out, 'why? Why couldn't they just be happy together?' I was ready for the tear-fest that often accompanies films where young love is cut short due to terminal illness. Unfortunately that was not meant to be, so we'll need to watch 'Marley and Me' again for a good tearjerker. The film is mostly enjoyable with a mid-movie change of genre. It had potential, real potential to become a memorable tragedy. The filmmakers had an opportunity to create a twist within a twist and could have used 'deceiving the audience' as a plot device. Without giving out spoilers, the unsavoury genre change will only appeal to a certain niche market popularised on the internet. 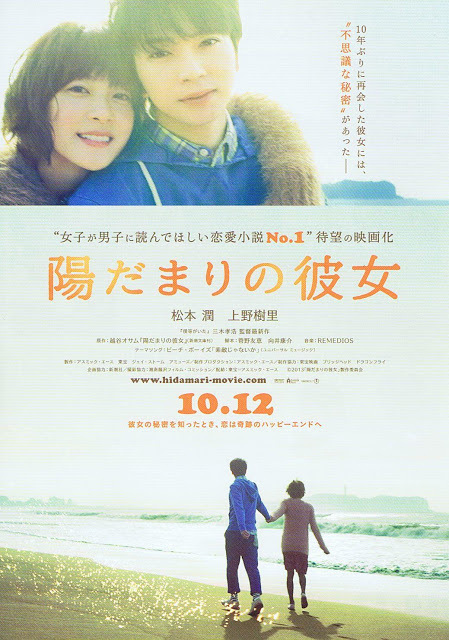 The film is based on the novel Hidamari no kanojo by Osamu Koshigaya, who might have handled this better. However given the difficulty of plausibly suddenly changing genres in a story, I highly doubt it. Girl in the Sunny Place is a mostly likeable even if the cast is unfamiliar to you. A simple romance which ultimately becomes nonsensical no matter how much you might ship (like the pairing of) the main characters/cast. Conversely, no matter how well the set-up of a story is initially, a far-fetched ending is its ultimate demise. Romance is like any other genre, like supernatural fiction, you need the audience to suspend scepticism yet you can't step too far away from logic. Step too far away and you risk alienating the audience to the dunce corner.